A microscope (Greek: μικρόν (micron) = small + σκοπεῖν (skopein) = to look at) is an instrument for viewing objects that are too small to be seen by the naked or unaided eye. Microscopes give us a larger (magnified) image of a tiny object. The microscopes we use in school and at home trace their history back almost four hundred years. The most common type of microscope—and the first to be invented—is the optical microscope. This is an optical instrument containing one or more lenses that produce an enlarged image of an object placed in the focal plane of the lens(es). However, human creativity, employed in exploring nature, manifested in numerous improvements and new microscope designs, including the electron microscope, scanning probe microscope, field ion microscope, acoustic microscope, and so forth. The science of investigating small objects using such an instrument is called microscopy, and the term microscopic means minute or very small, not easily visible with the unaided eye; in other words, requiring a microscope to examine. Microbiology is the scientific study of microorganisms, which are forms of life that are microscopic, such as bacteria, fungi, archaea, and protists. Microscopes extending the range of human visual sensing reveal a world much grander than the world visible to the unaided eye and remind us of how much we cannot know by our own senses. As new microscopes have revealed new layers of the microscopic world successively further and further removed from the human scale, they have raised new challenges of understanding because objects at different scales have their own distinctive behavior properties, sometimes quite different than those at the human scale. When a scanning tunneling microscope, for example, maps the surface of a crystal and shows us a neat array of fuzzy atoms we can get a better visualization of how the atoms may be arranged, but we also need to remember that those fuzzy balls comprise primarily empty space and that we, ourselves, are no more solid at the atomic level than those fuzzy balls in the picture. The first useful microscope is considered to have been developed in the Netherlands in the late sixteenth and early seventeenth century. There is almost as much confusion about the inventor as about the dates. Three different eyeglass makers have been given credit for the invention: Hans Lippershey (who also developed the first real telescope); Hans Janssen; and his son, Zacharias Janssen. Hans Janssen and Zacharias are often said to have invented the first compound microscope in 1590, but this was a declaration by Zacharias Janssen himself halfway through the seventeenth century. The date is certainly not likely, as it has been shown that Zacharias Janssen actually was born around 1590. By 1609 Galileo Galilei is also credited with inventing a compound microscope with a convex and a concave lens, which he presented to Polish king Sigismund III in 1612. 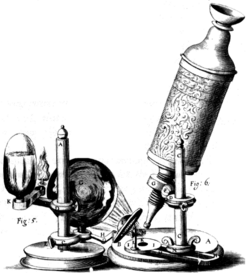 In 1625 Giovanni Faber of Bamberg (1574–1629) coined the word microscope by analogy with telescope. 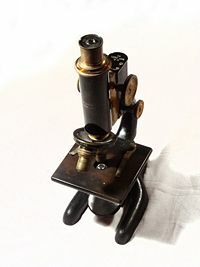 Lens quality in early microscopes was often poor so the images were not very clear. But even these rather crude microscopes were a great help in learning more about animals and plants. For example, in 1665, Robert Hooke (1635–1703) published Micrographia, a collection of biological micrographs developed using the compound microscope. Hooked coined the word cell for the structures he discovered in cork bark. Thonius Philips van Leeuwenhoek, better known as Anton van Leeuwenhoek (1632–1723), was a Dutch tradesman who is well known for his contribution to the improvement of the microscope, as well as his contributions toward the establishment of microbiology. Known as "the father of microbiology," Leeuwenhoek, using his handcrafted microscopes, was the first to observe and describe single celled organisms that he first referred to as animalcules, and which we now refer to as microorganisms. Leeuwenhoek's interest in microscopes began in 1648 in Amsterdam, when he saw a simple microscope, a magnifying glass mounted on a small stand used by textile merchants capable of magnifying to a power of three. It is believed that soon after 1665, he read Robert Hooke's book Micrographia, and this roused an interest in using microscopes for the purpose of investigating the natural world. Leeuwenhoek's interest in microscopy grew steadily until he was spending most of his nights and free time grinding his own lenses, improving the quality of his microscopes, and studying everything he could beneath them. Although he is sometimes erroneously referred to as "the inventor of the microscope," compound microscopes (with two lenses mounted together) had existed for about three-quarters of a century. However, they were very crude because the technology used made it difficult to build them properly. Leeuwenhoek's genius was in developing his skill to grind single lenses very precisely. It is likely that his microscopes were powerful magnifying glasses, not compound microscopes. During his lifetime Leeuwenhoek ground over five hundred optical lenses. He also created over four hundred different types of microscopes, nine of which still exist today. His microscopes were made of silver or copper metal frames holding hand-ground lenses. Those that survived the years are able to magnify up to 270 times. It is suspected, though, that Leeuwenhoek possessed some microscopes that could magnify up to five hundred times. In the 1860s, Ernst Abbe discovered the Abbe sine condition, a mathematical condition that must be fulfilled by a lens or other optical system in order for it to produce sharp images of off-axis as well as on-axis objects. This offered a breakthrough in microscope design, which until then was largely based on trial and error. The company of Carl Zeiss exploited this discovery and became the dominant microscope manufacturer of its era. In 1931 Ernst Ruska started to build the first electron microscope, a transmission electron microscope (TEM). In 1936 Erwin Müller invented the field emission microscope, and in 1951 he invented the field ion microscope and was the first to see atoms. In 1967 he added time-of-flight spectroscopy to the field ion microscope, making the first atom probe and allowing the chemical identification of each individual atom. In 1953 Frits Zernike, professor of theoretical physics, received the Nobel Prize in Physics for his invention of the phase contrast microscope. In 1981 Gerd Binnig and Heinrich Rohrer developed the scanning tunneling microscope, and in 1986, Binnig, Quate, and Gerber invented the atomic force microscope. In 1988 Alfred Cerezo, Terence Godfrey, and George Smith applied a position-sensitive detector to the atom probe, making it able to resolve atoms in 3-dimensions. Also in 1988 Kingo Itaya invented the electrochemical scanning tunneling microscope, and in 1991, the Kelvin probe force microscope was invented. Microscopes can largely be separated into two classes, optical theory microscopes and scanning probe microscopes. Optical theory microscopes are microscopes that function through the optical theory of lenses in order to magnify the image generated by the passage of a wave through the sample. The waves used are either electromagnetic in optical microscopes or electron beams in electron microscopes. The types commonly used today are the compound light microscope, stereo microscope, and the electron microscope. Scanning probe microscopes form images of surfaces using a physical probe that scans the specimen. An image of the surface is obtained by mechanically moving the probe in a raster scan of the specimen, line by line, and recording the probe-surface interaction as a function of position. The optical microscope is a type of microscope that uses visible light and a system of lenses to magnify images of small samples. Optical microscopes, through their use of visible wavelengths of light, are the simplest and hence most widely used type of microscope. There are two basic configurations of optical microscope in use, the simple microscope that uses only one lens for magnification, and the compound microscope that uses a set of many lenses in order to maximize magnification. Recent research  has shown that even simple microscopes, those with a single small lens, gave amazingly clear images to the earliest microscopists. The compound light microscope, in its simplest form—as used by Hooke, for example—would have a single glass lens of short focal length for the objective, and another single glass lens for the eyepiece or ocular. Modern microscopes of this kind are usually more complex, with multiple lens components in both objective and eyepiece assemblies. Today, compound microscopes serve uses in many fields of science, particularly biology and geology. Optical microscopes use refractive lenses, typically of glass and occasionally of plastic, to focus light into the eye or another light detector. Typical magnification of a light microscope is up to 1,500 times with a theoretical resolution of around 0.2 micrometers. Specialized techniques (e.g., scanning confocal microscopy) may exceed this magnification, but the resolution is an insurmountable diffraction limit. 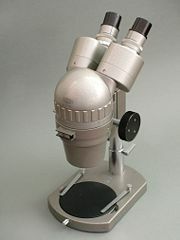 The stereo or dissecting microscope uses two separate optical paths with two objectives and two eyepieces to provide slightly different viewing angles to the left and right eyes. In this way it produces a three-dimensional (3-D) visualization of the sample being examined. The stereo microscope is often used to study the surfaces of solid specimens or to carry out close work such as sorting, dissection, microsurgery, watch-making, small circuit board manufacture or inspection, and the like. Other microscopes that use electromagnetic wavelengths not visible to the human eye are often called optical microscopes. The most common of these, due to its high resolution yet no requirement for a vacuum-like electron microscope, is the x-ray microscope. Electron microscopes, which use beams of electrons instead of light, are designed for very high magnification usage. Electrons, which have a much smaller wavelength than visible light, allow a much higher resolution. The main limitation of the electron beam is that it must pass through a vacuum as air molecules would otherwise scatter the beam. Instead of relying on refraction, lenses for electron microscopes are specially designed electromagnets that generates magnetic fields that are approximately parallel to the direction that electrons travel. The electrons are typically detected by a phosphor screen, photographic film or a charge-coupled device (CCD). Scanning electron microscope: looks at the surface of bulk objects by scanning the surface with a fine electron beam and measuring reflection. May also be used for spectroscopy. 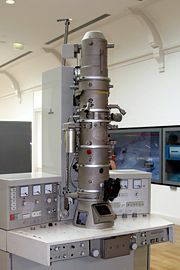 Transmission electron microscope: passes electrons completely through the sample, analogous to basic optical microscopy. This requires careful sample preparation, since electrons are scattered so strongly by most materials. It can also obtain detailed information on the sample's crystallography through selected area diffraction. In scanning probe microscopy (SPM), a physical probe is used either in close contact to the sample or nearly touching it. By rastering the probe across the sample, and by measuring the interactions between the sharp tip of the probe and the sample, a micrograph is generated. The exact nature of the interactions between the probe and the sample determines exactly what kind of SPM is being used. Because this kind of microscopy relies on the interactions between the tip and the sample, it generally only measures information about the surface of the sample. The field emission microscope, field ion microscope, and the Atom Probe are examples of point-projection microscopes, where ions are excited from a needle-shaped specimen and hit a detector. The Atom-Probe Tomograph (APT) is the most modern incarnation and allows a three-dimensional atom-by-atom (with chemical elements identified) reconstruction with sub-nanometer resolution. Acoustic microscopes use sound waves to measure variations in acoustic impedance. Similar to SONAR in principle, they are used for such jobs as detecting defects in the subsurfaces of materials including those found in integrated circuits. Dobell, C. (ed.) 1960. Antony van Leeuwenhoek and his "Little Animals. New York: Dover Publications. Ford, B. J. 1991. The Leeuwenhoek Legacy. London: Biopress, Bristol, and Farrand Press. ISBN 1850830169. Van Berkel, K. “Vermeer, Van Leeuwenhoek en De Astronoom.” Vrij Nederland (February 24, 1996): 62-67. This page was last modified on 7 November 2011, at 15:32.